Hardy's Reindeer Ranch: Now that I have learned that there is a reindeer ranch in Illinois, I must go! On top of being a reindeer ranch, Hardy's has a corn maze in the fall. This year's theme honors the Illinois Bicentennial! Taylor from Visit Champaign County suggests "For added excitement, try "Moonlight Madness" by navigating the maze at night with only a flashlight and the light of the moon." Illinois Bicentennial Corn Maze at Hardy's Reindeer Farm. Image courtesy of Visit Champaign County. Abbey Farms: During Pumpkin Daze at Abbey Farms in Aurora, Illinois, visitors can challenge themselves with the largest corn maze in Kane County. 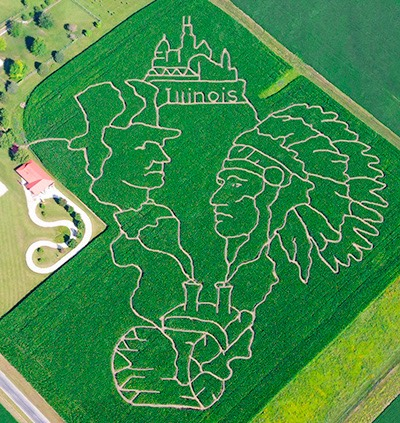 In keeping with this year's celebration of Illinois' 200 years, Abbey Farms' maze joins the Illinois Bicentennial theme. The farm also features televised game day action so visitors do not miss the action on Sundays! Richardson Corn Maze: The first corn maze we navigated also happened to be the World's Largest -- Richardson Corn Maze here in nearby Spring Grove, Illinois. Ever since our first adventure, Richardson has been part of our yearly fall fun. We usually start the maze in the early evening when it is still light and finish with the help of our flashlights for a little more challenge. A full range of farm fun rounds out a visit to Richardson and don't forget to make s'mores at one of the campfires! One of the bridges at Richardson Corn Maze that allows you to see the expanse of the maze. 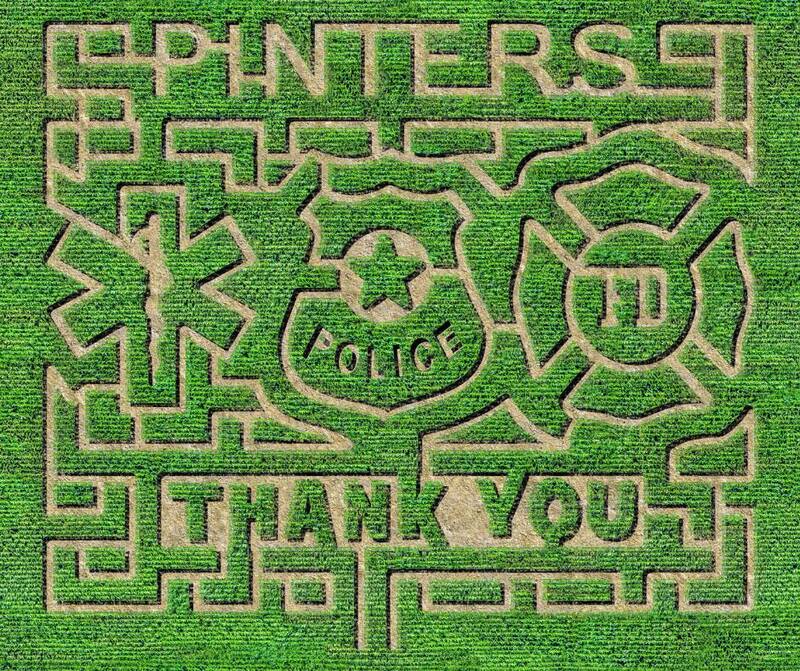 Pinter's Pumpkin Patch: In Decorah, Iowa, Pinter's Pumpkin Patch features a corn maze thanking our first responders. 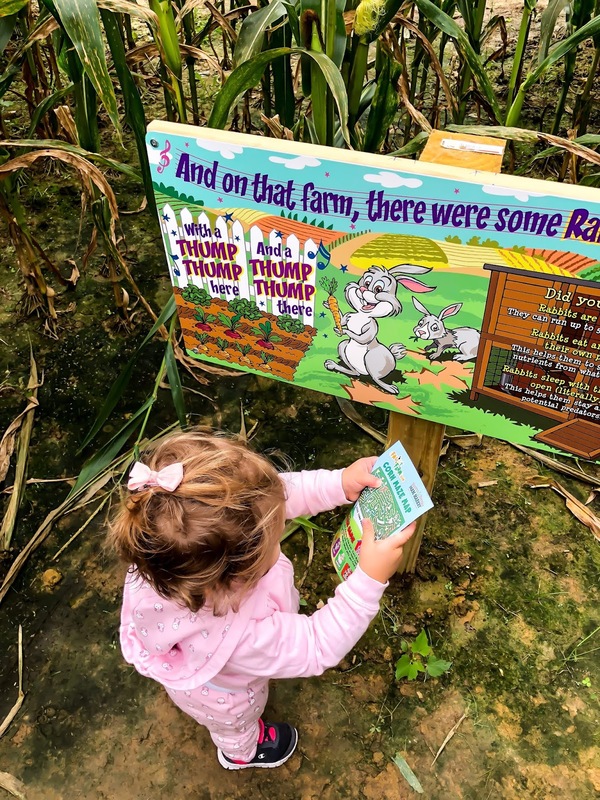 Charlene at Outside the Lines explains: "Visit Pinter's Pumpkin Patch for a cornfield adventure that is sure to keep you guessing! Enjoy a wagon ride to the pumpkin patch to pick out the perfect pumpkin; the huge jumping pillow; big slides; pedal go karts; sand tire hill and tire maze; win a game of life-size chess; and much more!" 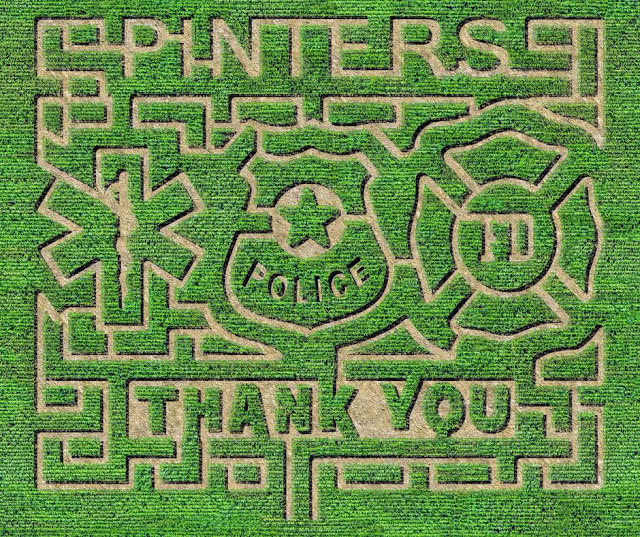 Pinter's Pumpkin Patch's corn maze thanking our first responders. Image courtesy of Pinter's Pumpkin Patch. Severs Corn Maze: Jenn of Day Tripper suggests Severs Corn Maze in Shakopee in Minnesota for a fall adventure. She explains: "If you go to one corn maze in Minnesota, make sure you check out Severs Corn Maze in Shakopee. They have so much there to entertain the kids including bouncing pillows, corn pit, an extreme corn pit, straw bale maze exotic petting zoo and bird encounter and just about everything included the price. You won’t be disappointed!" 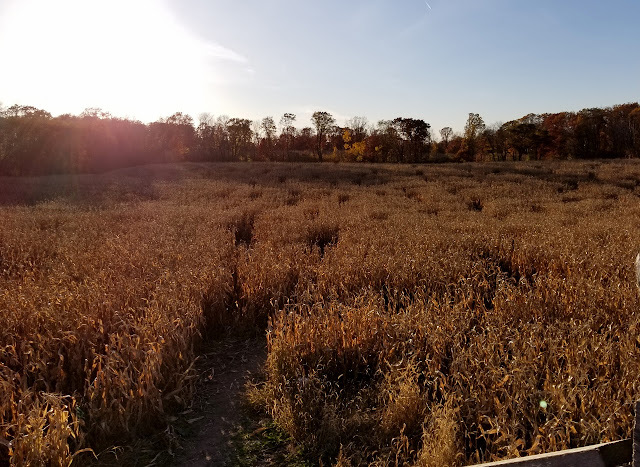 If you are looking for more Minnesota corn maze adventures, Jenn shares a collection of 9 of the Best Corn Mazes in the Twin Cities. Winding through Severs Corn Maze. Image courtesy of Day Tripper. The Burch Barn: Heading over to Spooner, Wisconsin, Vicki of That Was a First recommends The Burch Barn. Vicki details: "The slogan for The Burch Barn is “harvesting memories”, and they do a fantastic job of helping families year after year by doing just that. The Burch Barn is located in Spooner, Wisconsin and is home to one large corn maze that will challenge your family. There’s only one way in and one way out, but they do have a tower in the middle of the field that you can climb up and view the maze from above. 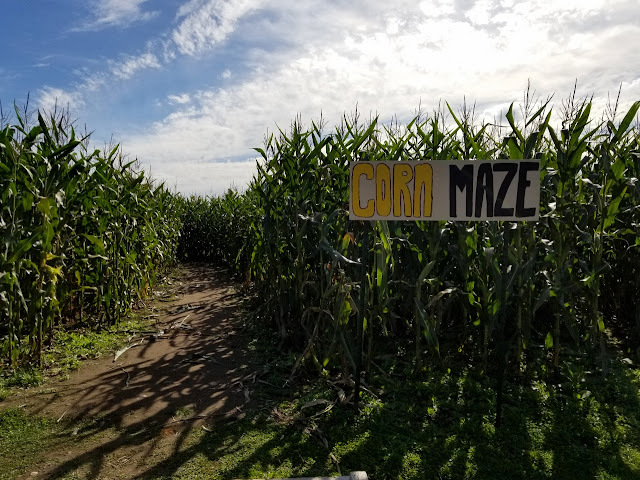 Once you master the corn maze, there is a lot more fall fun to be had! The Burch Barn has bounce houses, a haybale maze, a 100 foot gunny sack slide, a giant corn pit, and more. Cost is only $5 person, and they offer grain train rides for a couple of bucks more." Facing the challenge at The Burch Barn's Corn Maze. Image courtesy of That Was A First. Mommsen's Harvest Hills Pumpkin Patch: Vicki from That Was a First also suggests Mommsen's Harvest Hills Pumpkin Patch in Rice Lake, Wisconsin. 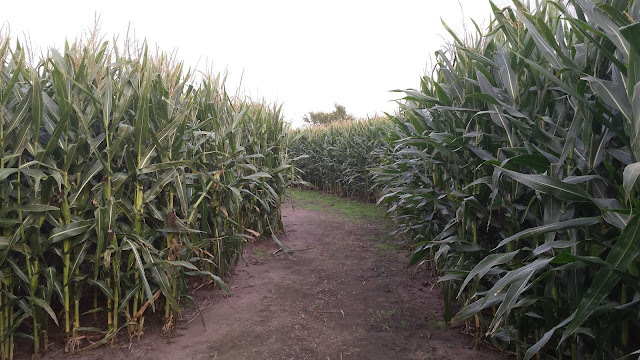 She details: "Mommsen’s Harvest Hills offers two corn mazes for families to get lost in. There is a maze more suited to younger kids, and then there is the big maze that is for everyone. 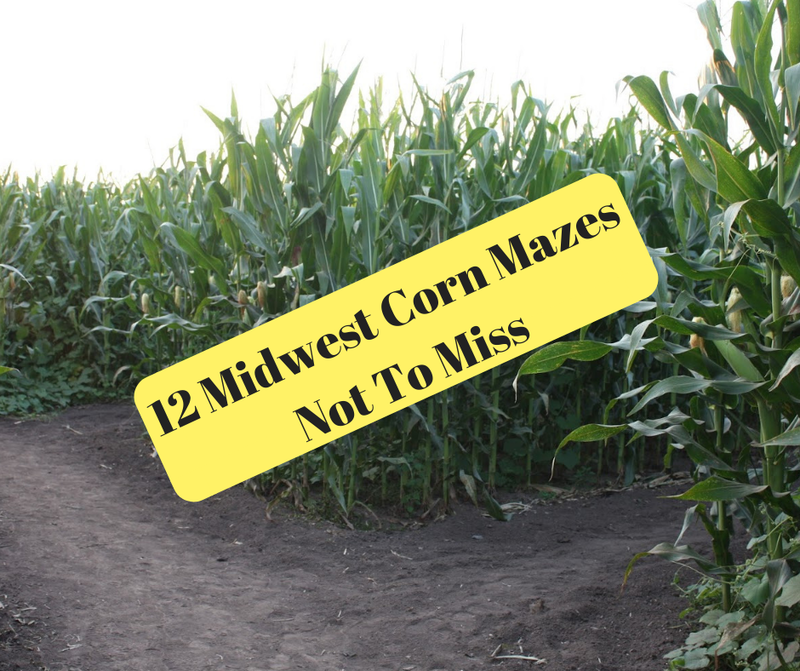 The big maze is one giant corn maze, and will keep your family busy for a while. Besides the corn mazes, Mommsen’s has a petting farm, play areas, weekend hayrides, and a shop that is full of crafts, baked goods, and fall décor. Mommsen’s is located in Rice Lake, Wisconsin and open every day from 10:00 am to 6:00 pm with special events taking place during the weekends. The cost for admission is based on the activities you want to do, and package deals are available." Can you solve Mommsen's Corn Maze? Image courtesy of That Was A First. 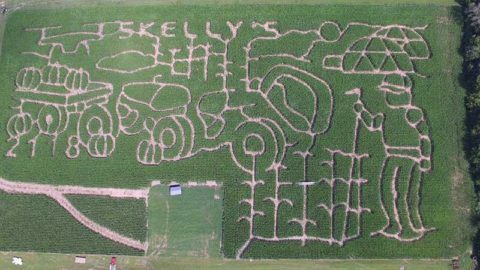 Skelly's Corn Mazes: Skelly's in Janesville, Wisconsin has been hosting corn mazes since 1998 making it one of the oldest corn mazes in the country. Skelly's hosts two mazes -- an Adventure Maze and an Impossible Maze. Additionally, Skelly's also features a smartphone GPS map. I will be checking out Skelly's later this fall, so stay tuned! Skelly's has been hosting mazes since 1998! Image courtesy of Skelly's. Blooms and Berries Farm: Stephanie of Consistently Curious takes us to Blooms and Berries Farm in Loveland, Ohio. 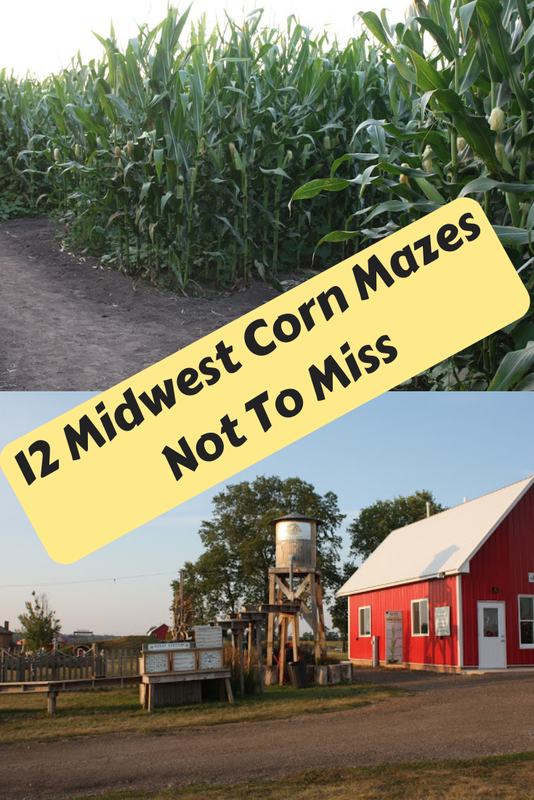 She shares: "There are two corn mazes located at Blooms and Berries Farm in Loveland, Ohio. Their 7 acre corn maze will send families on an hour journey through “mysterious animals escapades” before finding their way out. For those with little ones in tow, they offer a children’s corn maze that is themed to Old Mac Donald. Kids delight in finding all the animals throughout the maze, while parents breath a sigh of relief in knowing a they can get to an exit in a matter of minutes." A little navigator exploring the children's corn maze at Blooms and Berries Farm. Image courtesy of Consistently Curious. Beasley's Orchard: Beasley's Orchard in Danville, Indiana this year features an 8-acre Circle City Sports Corn Maze honoring Indianapolis area sports teams. The incredible maze includes 4-miles of paths navigated by a passport of questions. The maze is open select hours Fridays-Sundays through October. 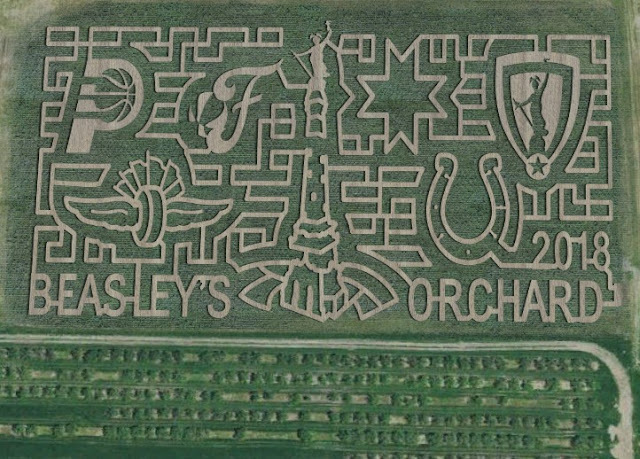 Beasley's Corn Maze honors Indianapolis sports teams. Image courtesy of Visit Hendricks County. Cornwell's Turkeyville Haunted Adventure: Located in Marshall, Michigan, the corn maze and additional attractions at Turkeyville give families some spooky Halloween elements without being too intense. 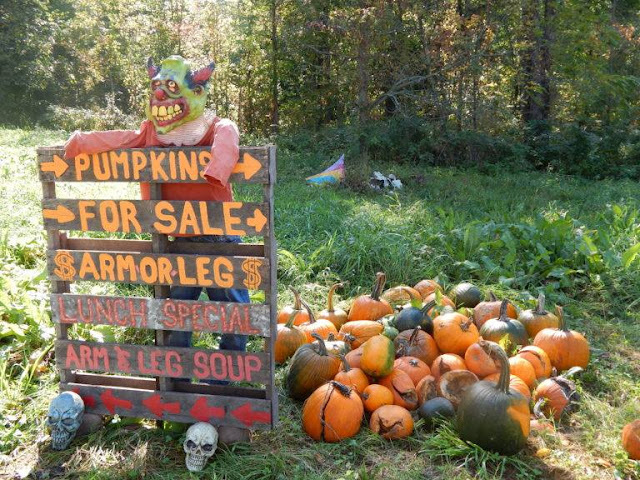 Courtney of the West Michigan Tourist Association details: "Visit Cornwell's Turkeyville every weekend in October for their "Haunted Adventure", which includes a Spooky Hayride, Corn Maze, Haunted Barn and a Ghoulish Train. They also have homemade spice donuts and apple cider available for purchase." Things get a little haunted at Turkeyville's Corn Maze. Image courtesy of Cornwell's Turkeyville. Jacob's Corn Maze: In Traverse City, Michigan, you will find a special Michigan-themed corn maze to wind through this fall. Courtney of West Michigan Tourist Association tells us: "Jacob's Corn Maze in Traverse City is once again open for the fall season. Now through October 29th, experience their world-class computer-designed 10-acre corn maze creation, unlike any other in Northern Michigan! This life-sized corn maze is fun for everyone, young and old alike. 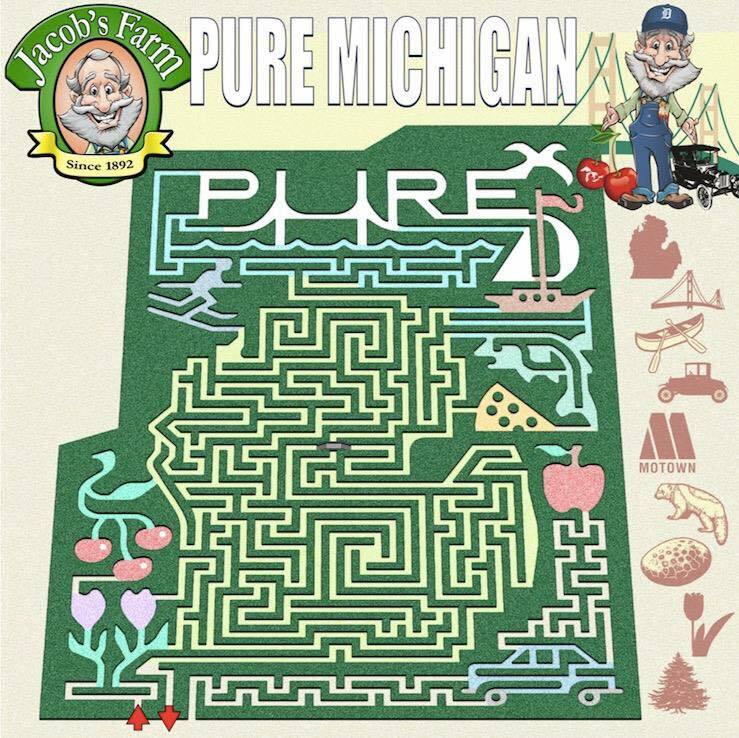 This fall at Jacob’s Corn Maze, they’re celebrating the state that we call home with a “Pure Michigan” theme. Join them at their 10-acre corn maze, open daily this fall." 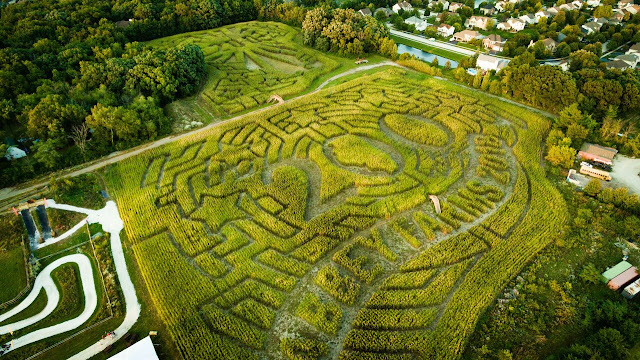 Jacob's Corn Maze celebrates Michigan this year. Image courtesy of Jacob's Corn Maze. I don't know about you, but I am certainly ready to get lost in a maze this fall! Whenever the days get short and the sun gets that warm autumn hue, I take a peek at the calendar to pick a day or two for a maze adventure. We love to pack a picnic to enjoy before heading out into the maze. Of course, before and after we enjoy fall treats on the farm! An afternoon or evening at a corn maze is a great way to spend a fall afternoon or evening!Have any other suggestions? Let me know and I will add them as Reader Suggestions! Email me at mommybloggingfun@gmail.com. The aerial shots are fantastic!